The Ramah Navajo chapter is located in Ramah, New Mexico and serves the Ramah band of Navajo, who have occupied the area near Zuni Pueblo since the sixteenth century. 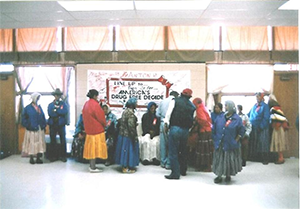 "Community meetings at the Ramah Chapter House, Ramah, New Mexico, May 8, 2013," photograph, (elderly a.jpg). Ramah Navajo Chapter. All rights reserved. Use with permission only. 1999 The Navajo Political Experience. Tséhílį́7/13/2016 Dine College Press.